Those of you who stop by regularly know that the Breakfast Room at our last house was my favorite room to decorate and to do a tablescape in. The shape of the room with the 3 windows and a door to the deck really brought in a lot of light, especially in the morning. The long white sheers on all the windows gave a dramatic feel to the space. The Breakfast Room at our new house still has a ways to go and doesn't inspire me yet. That's probably why this is the first tablescape in our new house after living here for a couple of months. Of course some colorful flowers helps make any space feel pretty. I bought a pair of the same Ikea Vivan sheers that we had at our last house. They are easy to clean and don't cost a lot if they need to be replaced. As you can see, Mr. DIY "jerry-rigged" the chain on the chandelier. It was too low and we were always hitting our head on it. I'm still deciding on which chandelier I want to buy to replace our current one. We also have to decide where the new placement will be, which will be determined by the piece of furniture that I want Mr. DIY to build to hold some of my extra dishes, pitchers and plate stands. 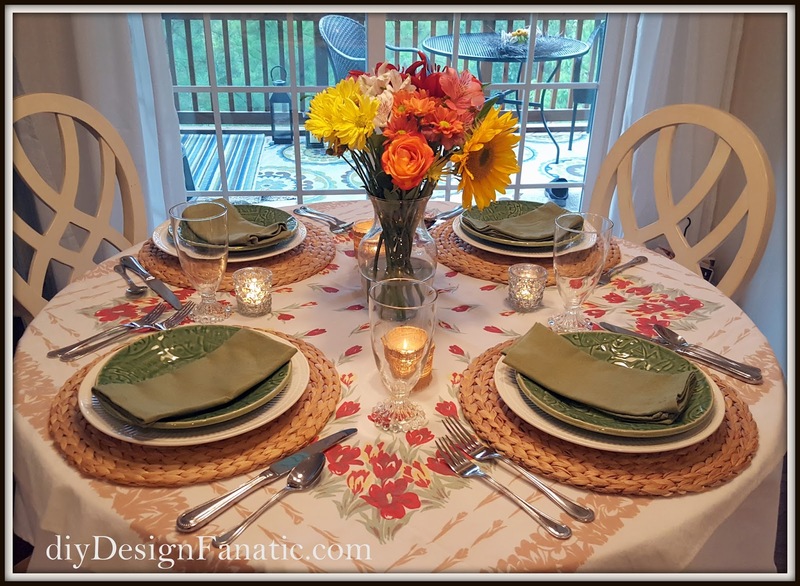 A vintage tablecloth is laid over a simple white one. Mikasa Italian Countryside are my everyday dishes and some green salad plates that were purchased at HomeGoods several years ago were added to that. The glasses are vintage "Boopie" from Anchor Hocking. I think the screened porch has replaced the Breakfast Room as my favorite space. I love spending time out there sitting in my mom's wicker rocking chair. The table is new and I'm working on adding a couple of pieces of furniture. These things take time. Yesterday was Mr. DIY's birthday and our daughter brought home some little Bundt cakes from a little place nearby called Nothing But Bundts. They were delicious! 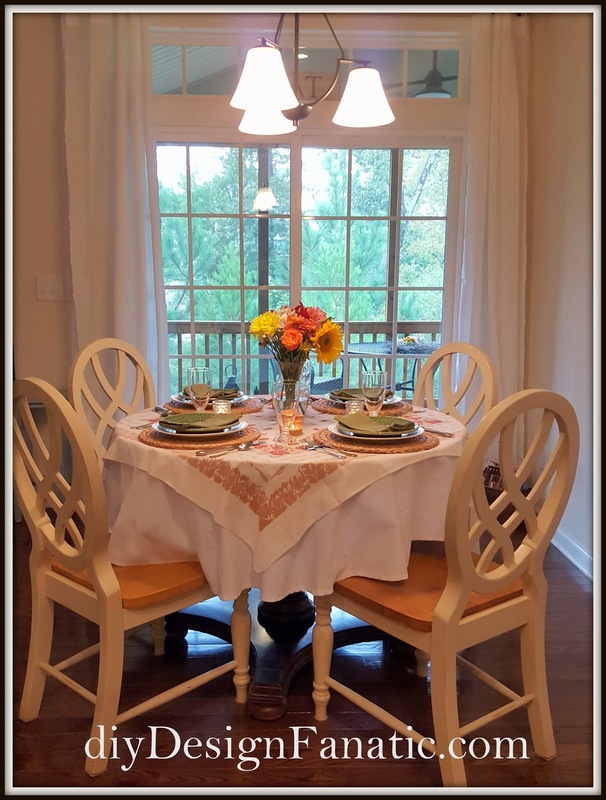 Thanks for stopping by to see the first tablescape in the Breakfast Room at our new house!